Welcome to the first Kate’s Curiosities post of 2015! Woo! I’m not sure if it was bad planning or good planning on my part to make the first post of the year a continuation of the last post of the old year. But either way, I hope you enjoy this further exploration into the dynamics of family in Harry Potter. If you just found this post and have no idea what I’m talking about, here’s the link to last week’s post. Basically, the idea was to ruminate on what Harry Potter can teach us about the complications of family, something I think we all reflect on at this time of year as we see family that we maybe don’t see much the rest of the year. Lupin actually seized handfuls of his own hair; he looked quite deranged. Yeah, I know, I quoted Frozen in the heading, but hear me out, it really does apply here! One of the most difficult scenes for me to read in Deathly Hallows was the scene above with Harry accusing Lupin of being a coward. While the concept of fear causing people to make bad decisions had been visited before in characters like Fudge and Pettigrew, to see beloved Lupin almost abandon his wife and future child brought a whole new level to how fear can warp our perceptions. Lupin clearly loves Tonks, but the concept of passing his curse onto another terrifies him so much that he can’t see how his actions will hurt people he cares about. I don’t think this makes him a coward, but I’m glad Harry made it clear to Lupin that he was letting fear cloud his judgement. He eventually does go back to Tonks and is overjoyed when his child, Teddy, is born. I think we can take two lessons from this. The first is that when loved ones are involved in serious decisions, fear has a tendency to set in. And this can elicit a lot of bad things – harsh words said, terrible actions taken. It happens to the best of us. We try to do what’s best for people we love, but actions motivated by fear, anger, and stress can hurt them even more. So it might be best to take a step back, talk, consult others, etc. On the flip side, when you are on the receiving end of a bad decision or harsh action, it can be easy to see this as evidence that the person doesn’t care about you, say some harsh words of your own. But we have to remember that fear, anger, and stress are temporary states of mind. Sometimes we have to give people time to sort themselves out, make it clear that we still care, and be willing to open communication. I’ve been making a lot of arguments about how the Harry Potter novels teach patience and understanding with family. But I should be clear to point out that not all families are created equal, and just because you love someone doesn’t mean you should have to live with them. Some home environments are toxic – emotionally and/or physically abusive, capable of eliciting depression and anxiety. Neither I nor J.K. Rowling would say you should stay in such an environment if you have a chance to get out. 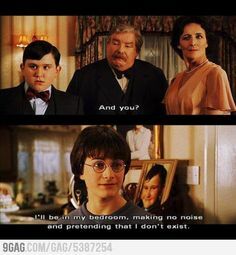 The Dursleys pretend their nephew doesn’t exist, give him no birthday presents or new clothes, and make him sleep in a cupboard under the stairs, among other things. There is never any question that the Dursleys are bad for Harry, and that his time away from them is for the best. Even Dumbledore, the king of patience and understanding, makes it clear that the Dursleys behavior was unacceptable. If not for the blood protection afforded to Harry by staying with his mother’s sister, he should never had had to live at Number 4 Privet Drive. While Harry comes to accept that they are who they are, he does not feel obligated to stay with them once he turns 17. Indeed, Rowling implies in interviews that Harry never contacts his aunt and uncle, and only occasionally contacts Dudley. And it is entirely in his rights to do so, blood or not. Sirius Black is also never begrudged for running away from his pureblood supremacist family at the age of 16 and going to live with the Potters. Trapped in his parents’ house (used as headquarters for the Order of the Phoenix) later in life, he is forced to deal with his mother’s insulting portrait and a host of bad memories, which are probably what drove him to become more reckless near the end of his life. Just being in the house was toxic for him, after the family was long dead. Sometimes we feel that people have hurt us or done us wrong. And we feel the need to distance ourselves from them. As detailed above, sometimes this is necessary. Getting hurt or angry is normal. But letting that fester into a grudge can be destructive, and not just for the person it’s aimed towards. Grudges in families are particularly bad, and lead to a lot of grief years later. Take the case of Mrs. Petunia Dursley. As a child, Petunia watched her sister Lily do impossible things, looking on with a mixture of curiosity and disapproval. When Lily was accepted to Hogwarts and appreciated by their parents, Petunia desperately tried to get into Hogwarts as well and was rejected. She held her sister’s talents against her for the rest of their lives. Even though Lily always tried to reconnect with her sister, Petunia continued to shut Lily out. She often pretended she didn’t even have a sister. However, there are indications that Petunia still loved Lily in the end. According to Lily’s letter in Deathly Hallows, Petunia thought enough about Lily to send her a vase for Christmas. It is also said (though I haven’t been able to find an official source) that Petunia arranged Lily and James’s funeral in Godric’s Hollow since James had no family left. She also agreed, however grudgingly, to take in Lily’s son. But her grudge against Lily affected her even then, as she tried to stamp the magic out of her nephew and refused to truly accept him as family. It’s hard to say how much she truly regretted that she never reconnected with her sister, but the quote above (in movie!verse) and her emotional reaction to Dudley’s peace offering (in book!verse, detailed below) make me think that she did care for Lily, but couldn’t find the strength come to terms with her pain and let go of her grudge. And that is such a sad, sad thing. Lily, Harry, and Petunia were all hurt by a childhood grudge, and none of these relationships will ever have the chance to heal because of it. It is understandably difficult to talk about things that hurt us, especially to the people who did it. But sometimes I think we have to ask ourselves, what if we never get another chance? What if we lose someone forever without making amends? Something to think about. I don’t agree with this. Like, at all. People have a really hard time changing, and going into any relationship – romantic, familial, or platonic – with the hope that someone will change sets you up for a world of disappointment. Petunia never took steps to make amends with her sister. Lily, I think, had to come to terms with that, much as it saddened her. As I stated in Part 1, we have to accept people for who they are. However… that doesn’t mean that family can’t change. Because although Petunia never made amends, her son kind of did. It wasn’t a grand gesture, or even a true apology. But he did show Harry that he appreciated him, was concerned for his well-being, and hoped he would be okay. This opened the door to future contact that Harry never kept up with his aunt and uncle. However awkward or tense their meetings may be, Dudley and Harry were still able to hold up a relationship as adults after a lifetime of antagonism, and that only happened because Dudley was able to adjust his views on Harry, on his upbringing, and on magic — if only a little. But Harry had to be willing to accept that Dudley changed as well for this to work. It really goes both ways. Visible forms of love are important in any family. I will never understate the value of hugging, kissing, and general affection. But these are acts that are easy to understand in the moment, easy to appreciate. There are other ways of showing love that are not as easily recognized, and just as or more important. There is a power in fantasy to give such invisible concepts a concrete shape, and in that vein Harry Potter takes time to highlight both forms of love. A huge part of the novels’ backbone is Lily Potter’s sacrifice for her son, which manifests as an invisible, but very potent magical protection from Voldemort up until Goblet of Fire. And in some ways it still protects him, even after Voldemort gets around it, as staying at the Dursleys still works as protection for him up until he is 17. 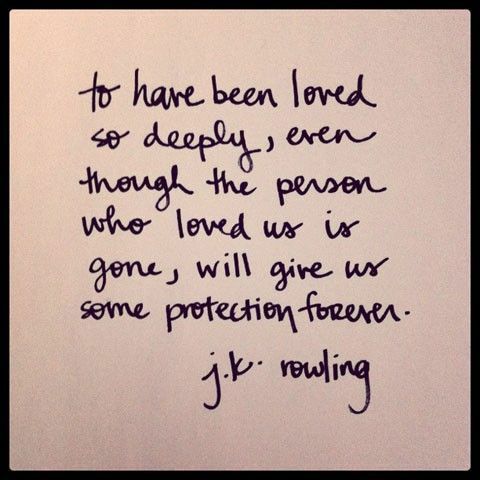 Perhaps love doesn’t act as literal protection in our world, but Rowling is still able to symbolically show the power of love that remains despite separation, time, even death. But as his trembling fingertips stretched toward the creature, it vanished. Harry, without even knowing his father’s Animagus form was a stag, produces him as a protector against the Dementors. In this way, his father’s love and spirit still resides with him. Snape’s Patronus is also an interesting example. Snape’s Patronus is a doe because Lily Potter’s was a doe (loved ones often develop matching Patronuses since their loved one is their happiest memory). Though Snape doesn’t care much for Harry, he secretly protects him during his time at Hogwarts due to his love for Lily. The doe is the manifestation of that, and appears to Harry when he most needs guidance. However you feel about Snape’s relationship to Lily, we could say Lily’s love for Harry acts through Snape, as symbolized by the doe. Snape does it with no expectation of being recognized or thanked, and in fact acts like Harry’s enemy most of the time. It isn’t until later that Harry understands how much Snape sacrificed out of love for his mother, which is why Harry tributed the man through his son’s middle name. In an unconventional way, Snape reminds us that people often do things for us, seen and unseen, whose value we can’t understand until we are older. It’s an interesting and inspiring thing, how we continue to learn the depths of love, familial and otherwise, throughout our lives. Likewise, Harry Potter is one of those series you can visit again and again and still find something new to appreciate about the depth of the narrative created. Thanks so much for following this two-part exploration. I’d love to hear in the comments what lessons Harry Potter has taught you about family. Tune in next Tuesday morning for a new post (yes, I’m changing my posting date. New year, new day)! Learn more about the blog here, about me here, and resources here. Check out the links in the sidebar for related works and Pinterest boards, and leave a comment to let me know if you have any thoughts or ideas. Note: In this analysis, I am synthesizing Harry Potter book canon, Pottermore articles, and Word of God from J.K. Rowling. I know some readers prefer to disregard Rowling’s interviews, and they should be taken with a grain of salt since spoken words are not as thought through as written work. But in this case I am taking it into consideration. Children's fantasy writer. Recent graduate in creative writing and psychology. Ravenclaw. "Fantasy's hardly an escape from reality. It's a way of understanding it."